, : Quickening Licid loses this ability and becomes a creature enchantment that reads "Enchanted creature gains first strike" instead of a creature. 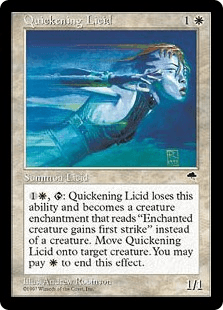 Move Quickening Licid onto target creature. You may pay to end this effect.